The biochemists from Harvard University have found that resveratrol contains a sirtuin gene, which is called a longevity gene. According to the scientists, resveratrol activates the gene of longevity, thereby slowing down the aging process, and increases life expectancy. The studies on the biologically active form of resveratrol, trans-resveratrol, demonstrated a clinically proven activating effect of the latter on the longevity gene. Due to increasing the number of mitochondria in the body’s cells, trans-resveratrol is able to increase the energy potential and improve the sensory-motor bodily functions. Resveratrol, red wine extract and grape seeds form a balanced combination of the natural complex RESVERASIN® that helps restore the bodily functions and fights aging. Resveratrol is a natural antioxidant, a polyphenol, that contributes to healthy longevity, reduces the risk of heart attacks and strokes, slows down the development of the age-related diseases, normalizes lipid levels in atherosclerosis and coronary artery disease, has an oncoprotective effect, protects skin from free radicals, and produces a beneficial effect on collagen synthesis. Red wine extract increases the body’s resistance to unfavorable environmental factors, improves blood circulation, strengthens the vascular walls, demonstrates anti-sclerotic properties, and lowers blood cholesterol levels. Grape seeds extract contains strong antioxidants proanthocyanidins that potentiate the body’s natural ability to inhibit the activity of free radicals, strengthen and clean up vascular walls, lower the risk of cardiovascular complications, including myocardial infarction and arterial hypertension, restore the collagen structure and prevent its destruction, thus improving skin appearance and reducing the number of wrinkles. RESVERASIN® helps slow down the aging process, prevents the development and progression of the age-related cardiovascular, ophthalmic and neurodegenerative conditions, normalizes blood lipids and cholesterol levels in atherosclerosis and coronary artery disease, improves vascular tone and elasticity in venous and arterial insufficiency, and preserves the skin’s beauty and youth. NUTRITIONAL AND ENERGY VALUE (CALORIC VALUE) PER 100 g OF THE SUPPLEMENT: proteins – 19.0 g, carbohydrates – 1.3 g, fats – 0 g; 345.1 kJ (81.2kcal). RECOMMENDATIONS FOR USE: RESVERASIN® is recommended as an additional source of resveratrol, polyphenols and proanthocyanins demonstrating potent antioxidant properties to normalize the metabolism and restore staying power. 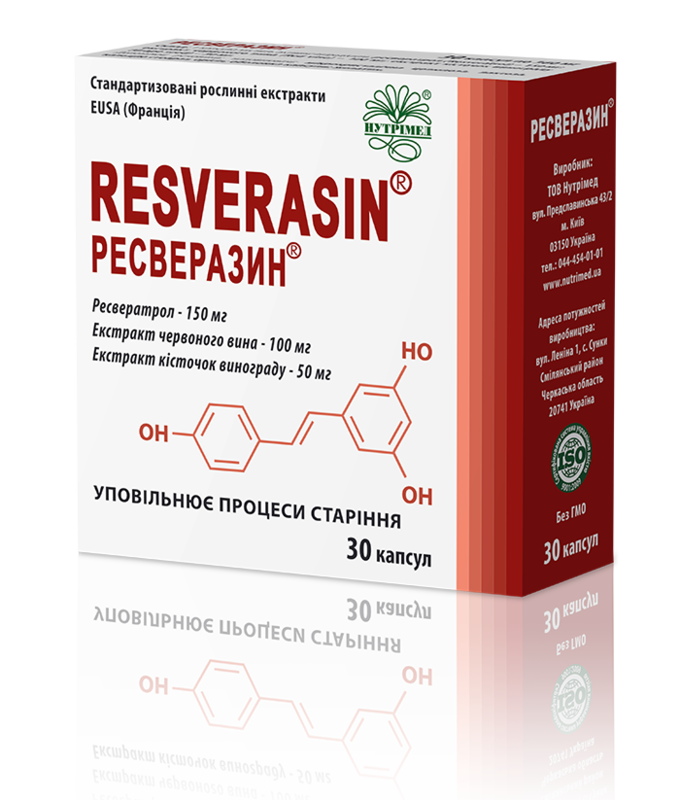 RESVERASIN® is suitable for the improvement of a person’s vitality and the slowdown of physiological aging; in case of impaired nervous, cardiovascular and endocrine systems functioning, as well as in ophthalmic, gynecological and urological conditions, when preparing for pregnancy, for persons with impaired immunity, in case of fatigue and nervous exhaustion. It improves metabolism in metabolic syndrome, increases the insulin sensitivity of cells in type 2 diabetes. It has a detoxification effect, binds and neutralizes free radicals in all conditions associated with an oxidative stress. It attenuates the negative impact of toxins in nicotine dependence. METHOD OF ADMINISTRATION AND RECOMMENDED DAILY DOSE: adults should take 1 capsule 1-2 times daily after meals swallowed with plenty of drinking water. The treatment course is 2-3 months. The course can be repeated if needed. CONTRAINDICATIONS: individual intolerance of the ingredients, pregnancy and breastfeeding. PHARMACEUTICAL FORM: capsules with the contents weight of 360 mg ± 7.5%. STORAGE CONDITIONS: store in the original package at temperatures 4 to 25°C, in a dry place protected from light, out of reach of children.